Abstract: The 2018 HK Electronics Fair Spring Edition will be held from 13th to 16th April in the Hong Kong Convention & Exhibition Centre. Airwheel will attend the show with its new and fascinating products, say the smart suitcase at booth B15&B17 (3F) in hall 3. The 2018 Hong Kong Electronics Fair is held from 13th to 16th April in the Hong Kong Convention & Exhibition Centre. Hundreds of thousands of visitors from all over the world will come to attend this international trade fair. Airwheel with a wide range of products such as the autonomous suitcase, smart power chair and other kinds of electric scooters at booth B15&B17 (3F), in Hall 3. 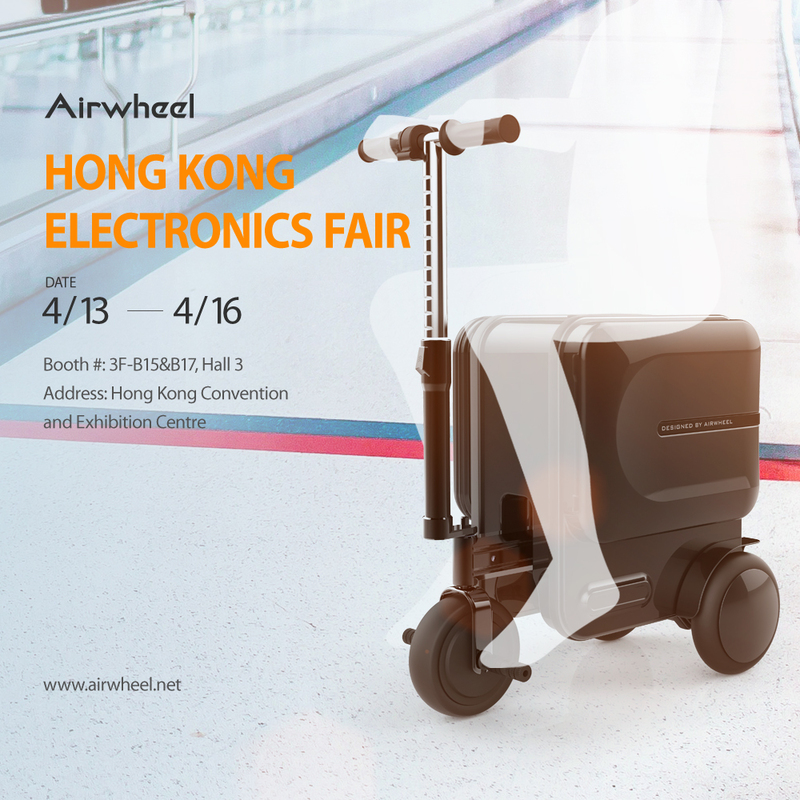 HK Electronics Fair creates a platform for Airwheel to gain its global visibility and an chance for visitors to test it on spot. More importantly, it is a golden opportunity to release new product and Airwheel SE3, a ridable suitcase will make its international debut. SE3 features automatic retractable design, large wheels, electronic brake, and mobile app remote control and more. It is lighter and sturdier with the ABS & PC outer shell and aluminum frame to provide high crush resistance. First, SE3 smart luggage's automatic retractable design offers much convenience. Hidden riding levers save space to the maximum; at the same time, one-button auto-expanding, with simple operation, and free conversion between riding and dragging. The size of SE3 is 610X335X770mm and its folding size is 490X335X560mm. Also, the telescopic and concealed handlebar design is to provide easy steering experience, and users just push the throttle to accelerate and press the button to brake. Secondly, its unique electronic brake design of SE3 smart suitcase that can be ridden allows users to press the button to brake in order to ensure the safe riding. Moreover, the branded non-slip large wheels with special treads and excellent grip performance make it possible to overcome various road conditions while riding. Thirdly, users can control it via mobile app. They can drive the SE3 with smart phone App with the max. speed 5km/h, enjoy the fun playing together with it, or load other carry bags on it when travelling. Come experience SE3 smart electric suitcase at booth 3F B15&B17, in Hall 3.